More info:From £1575 - £1625 excluding flights. Prices based on 2 adults sharing. Single supplement available. Mimimum age 14. 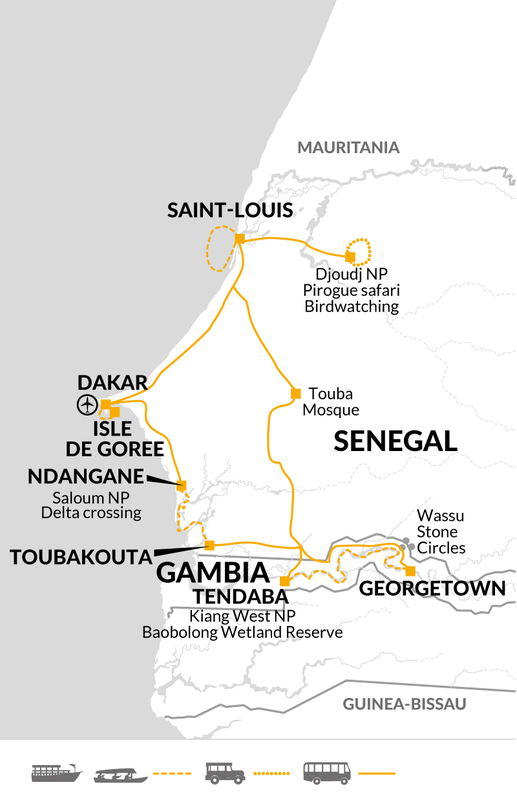 Villages balanced on oyster shells, seaside ex-slaver cities, world-important wetlands – this unconventional cruise around Senegal and the Gambia reveals two sides of a wildlife-rich waterscape. It’s less a one-ship journey and more a jigsaw of boat trips, including a two-day sailing on a converted groundnut vessel. Senegal has a distinctly French flavour. It’s not just the language, either. Towns like Saint-Louis are a jumble of 19th-century colonial buildings, while the House of Slaves on Island of Goree documents the dark days of the French slave trade. You’ll travel by boat into Djoudj National Bird Sanctuary, where up to 15,000 pelicans dive for fish and crocodiles and pythons cut the waters. A border-hop to the Gambia will show you the other half of this watery world. A cruise up the Gambia River shows off hippo country, and on some evenings you’ll get to stay in riverside rondavel cottages. Best of all, you’ll get a real insight into the lives and landscapes of these West African countries – from the mysterious Wassu Stone Circles to the oyster shell islands of Saloum Delta National Park. It is always our aim to show you the real country and this tour combines all that is best in this corner of West Africa, from the wildlife, historic cities and beautiful natural heritage. We’ll see the main sites but there are also many opportunities to learn about local life on visits to villages. In order to give you the best experience we use local crew throughout this tour who can give that unique insight into their culture and customs which really enhances our trip, as well as generating local employment and delivering direct economic benefits to the areas we are travelling in. Our visit to Fadiout is a great example as this community run visit not only is a great experience for us but delivers economic benefits to the village as a whole. Aboard our riverboat we also have a great opportunity to learn about Gambian culture from our local crew…and quite possibly some lessons in Gambian cookery too! We also do this by using locally owned hotels, many of which buy their food produce from local suppliers, and spreading our business to a variety of local restaurants. We visit several national parks on our tour. Conscious that these are fragile environments, we try to minimise our impact by adhering to strict environmental guidelines and educating crew and customers on the ‘do’s and don’ts’. The birdlife was spectacular- high numbers and close views. Learning about the culture and seeing the people and landscape. The overnight river cruise was fabulous as expected. Accommodation much better standard than I expected. Our guide was excellent, being able to answer any questions about the place you might have and nothing was too much trouble, made the holiday very relaxing, felt safe at all times. There is some waiting around at times due to it being a group holiday and a couple of longish drives - use the time to people watch, its fascinating! Senegal does seem to be 2 pin round plugs as in Europe. Note 2 days without electricity. Note there is a small tips kitty to contribute to on arrival. Note no need to take Euros, pounds are changed fine. There is opportunity to change money on first morning. If you are vegetarian you will have enough to eat but it won't be exciting and may be odd combinations at times and meals can be late and very slow to arrive, I took some dried snacks with me. Be wary about using swimming pools which may not be clean. Yes, we had a couple of unexpected trips to a school and to a local family, which were done respectfully and we were able to contribute to them if we wished. We were shown a well that had been put in for a women's cooperative garden and had a talk about the guide's charity work in education field. A real break, great mix of birdwatching and culture and history, itinerary generally well planned and ran extremely smoothly. All of these, to some extent. We had an excellent leader and driver. The birds we saw were great but apart from that, i don't think these two countries have much else to offer. I wonder if more locations in the east and south of Senegal might be worth exploring. Don't forget repellant, binoculars and a torch light. Take with you some clothes to give away, they can be left for community projects. I would concentrate it a little more if I had to organize it myself because it's very relaxed and my opinion was shared by others in the group. Anyway it's an interesting trip, especially if you're interested in birds. Our guide Baba was absolutely exceptional.